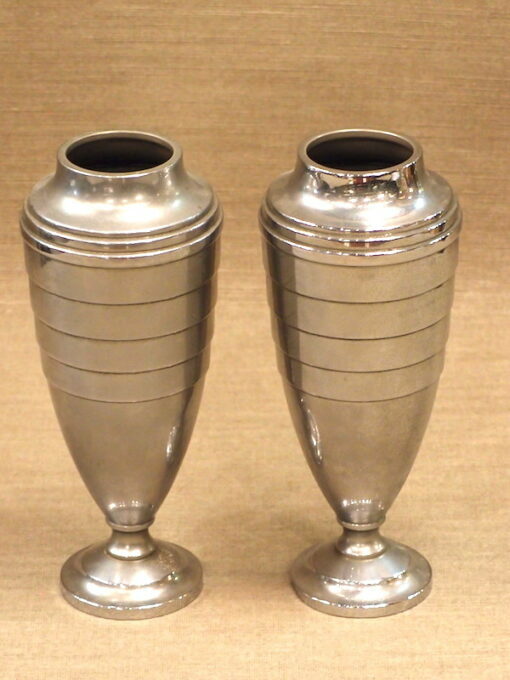 Pair of stepped Art Deco' style vases, probably late 20th century. The term Art Deco' is an elision of the " Exposition Internationale des Arts décoratifs et industriels modernes", an exhibition held in Paris is 1925 that showcased the new Jazz age products. From this the term Art Deco' was coined in 1966. This is why Phryne Fisher never says Art Deco': the term was only coined when Perigrine Fisher is solving her crimes! The apostrophe at the end indicates the elision of 'ratifs! 1960s youth reassessed both Art Nouveau and Art Deco and thought they might not be kitsch rubbish after all. 10.5 cm wide and 25.5 cm tall. Pair of stepped Art Deco‘ style vases, probably late 20th century. The term Art Deco’ is an elision of the ” Exposition Internationale des Arts décoratifs et industriels modernes”, an exhibition held in Paris is 1925 that showcased the new Jazz age products. From this the term Art Deco‘ was coined in 1966. This is why Phryne Fisher never says Art Deco‘: the term was only coined when Perigrine Fisher is solving her crimes! The apostrophe at the end indicates the elision of ‘ratifs! 1960s youth reassessed both Art Nouveau and Art Deco and thought they might not be kitsch rubbish after all.